But both the story and the 2016 report it’s based on leave out some pretty critical information on actual concentrations of these chemicals in fracking fluid and public exposure to the chemicals. In other words, there is zero context explaining that a substance’s mere existence does not mean it is causing harm. Before getting into why that’s essential information to include in any honest discussion on the topic, it’s important to have a little background that MarketPlace failed to include on both the Partnership for Policy Integrity (PPI) report the “new” EPA documents were pulled from, and the report’s lead researcher, Dusty Horwitt, who is quoted in the story. The PPI report, titled “Toxic Secrets,” was funded by a trio of foundations – Heinz Endowments, Park Foundation and Tides Foundation – that have collectively funded more anti-fracking initiatives and research than EID could possible list. Notably, MarketPlace also received over $2 million to create a program on “global sustainability and the economy” from the Tides Foundation. Horwitt’s background leaves little wiggle room for debating his viewpoints on fracking. He’s been discussing oil and gas for years as a representative for anti-fracking groups like the Environmental Working Group and Earthworks – who actually declared a “war on fracking” – before conducting this research for PPI. EID detailed the multitude of flaws and deliberate inaccuracies of the PPI report when it was released last year – much of which is reiterated in this recent MarketPlace story. But there’s one point in particular that’s worth repeating: exposure and dose context is critical. This article’s headline, “Documents Show Undisclosed EPA Health Concerns on Fracking Chemicals,” gives readers the impression that there are these secret chemicals being used in the fracking process and that those chemicals are causing health issues. But that’s not the case. 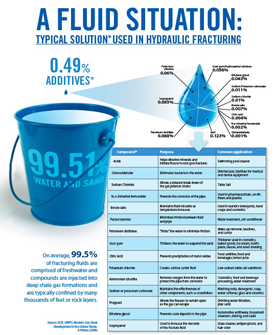 First, if someone wants to know what additives have been used to hydraulically fracture nearby wells, FracFocus.org has publicly available details on over 127,000 wells. Fracking fluid compositions, while not all exactly the same, are typically pretty similar: roughly 95 percent water, four percent sand and one percent chemical additives. The EPA has detailed information on those chemicals, and as the above EID infographic shows, most of them can be found in common household items like laundry detergent. The chemical has to be present. The chemical has to be toxic in the form it is present. The concentration has to be high enough to cause harm. There has to be an exposure pathway to humans or environmental receptors. This conclusion was based largely on an honest scientific assessment of dose and exposure levels. CDPHE’s assessment was based on air sampling, but with more than 25 studies demonstrating that fracking does not pose a major risk of groundwater pollution, the science supports that there has not been widespread exposure to chemicals used in the hydraulic fracturing process via water pathways, either. None of this is explained in the MarketPlace story or Horwitt’s report. And yet, it is such a critical element in understanding the health risks associated with constituents that may or may not even be present on a well pad, let alone reaching nearby properties at levels that would be cause for concern. MarketPlace reports that, “Pennsylvania residents alone filed 9,000 complaints about drilling pollution and well problems from 2004 to 2016. That’s one complaint for every well drilled.” But in reality, the Pennsylvania’s Department of Environmental Protection has explained that only a fraction of those (284) of those 9,000 complaints were found to even be related to oil and gas. This claim of “9,000 complaints about drilling pollution and well problems from 2004 to 2016” comes from a report by the vehemently anti-fracking activist blog Public Herald, which is funded by the anti-fracking Heinz Endowments and The 11th Hour Project. The Public Herald report and its researchers have such credibility issues that at the time of its publication, MarketPlace’s fellow NPR station, StateImpact PA – which also happens to be funded by the Heinz Endowment – was the only outlet to cover it. Not only was the entire Public Herald report written, reviewed and reported on in an echo chamber funded by Heinz, but as EID detailed in the post on the first part of this series, the Heinz Endowments (along with the Park Foundation and Tides Foundation) also funded the research that MarketPlace based its first story of this series. This MarketPlace story is part of a series – stay tuned to EID for a debunk of the second story in the series.